If you follow me on Instagram I just want to give you the biggest hug ever! @inkbyjeng just hit 40K followers and I'm beyond ecstatic to share that I'm hosting a giveaway to say thanks! Details can be found here. Even though these pesky leaves keep trailing in behind me, I can't help but admire their beautiful shapes and colors. 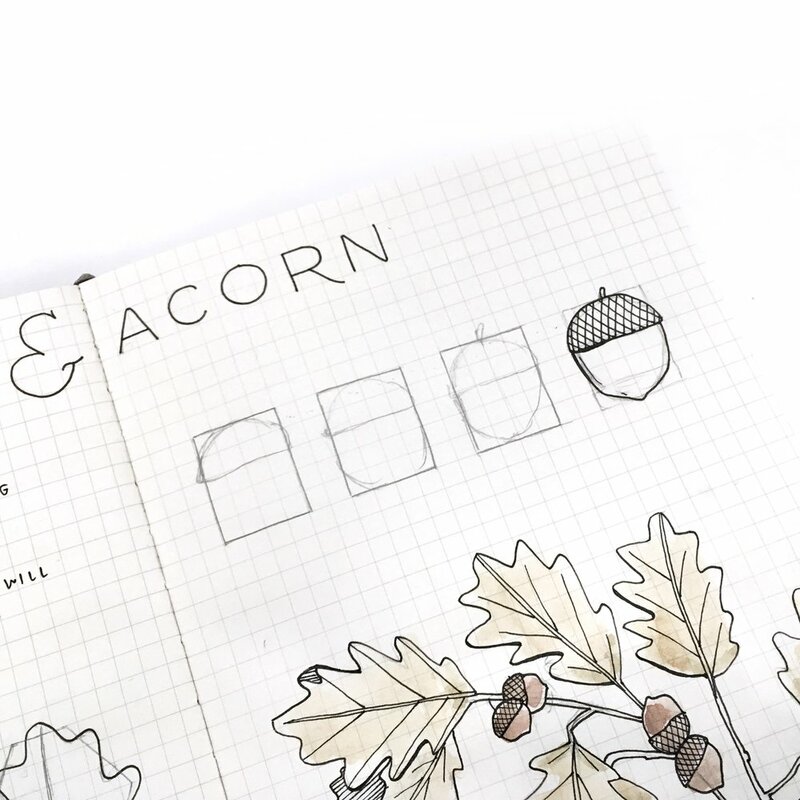 So with fall in full swing, I've decided to kick off the re-start of my #drawwithjeng tutorials with oak leaves and acorns! 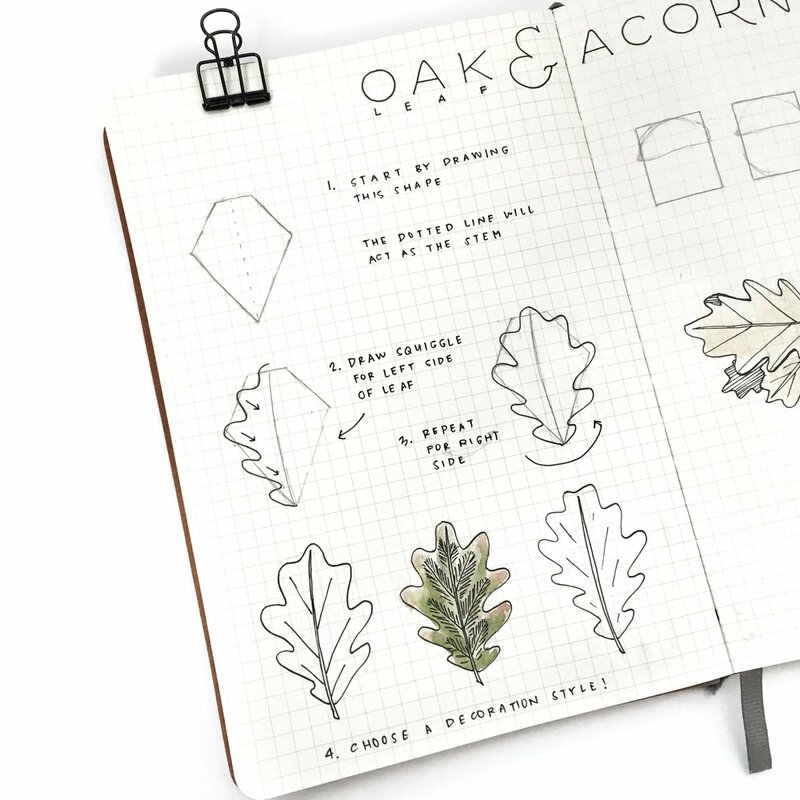 These shapes are super simple and can be layered to create the perfect journal spread. I added some color to this drawing, but it also looks great in black and white. Here's another drawing tutorial. This has shown up in my spreads a few times and I absolutely love drawing them because they are super easy but instantly adds a pop to any spread. 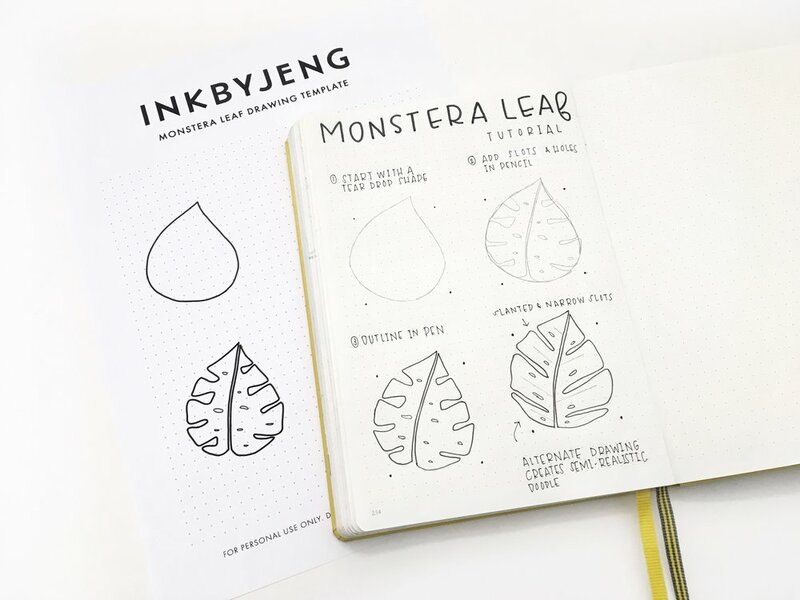 Grab your template here for easy tracing of the teardrop shape. If you tried out this tutorial in your journal let me know! Tag photos with #inkbyjeng and @inkbyjeng so that I can add you to the upcoming feature on my site! My tropical leaf April theme has me so excited. I've been filling my weekly spreads and my collections with banana, palm and monstera leaves. This theme was inspired by my love for all things tropical and my recent trip to Sydney, Australia where I think I took more photos of giant leaves than people. 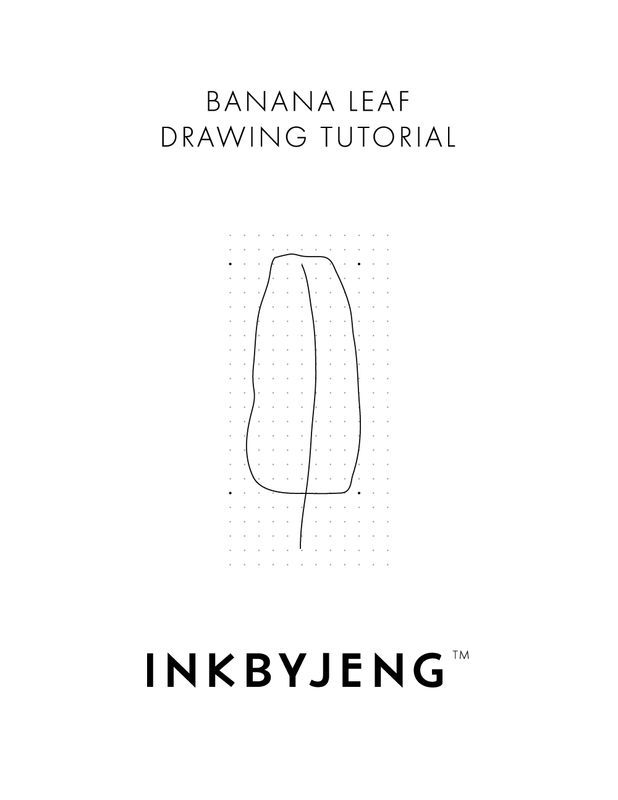 I decided to do a how to draw banana leaf tutorial within my Bullet Journal®. Follow me on Instagram for more tutorials! 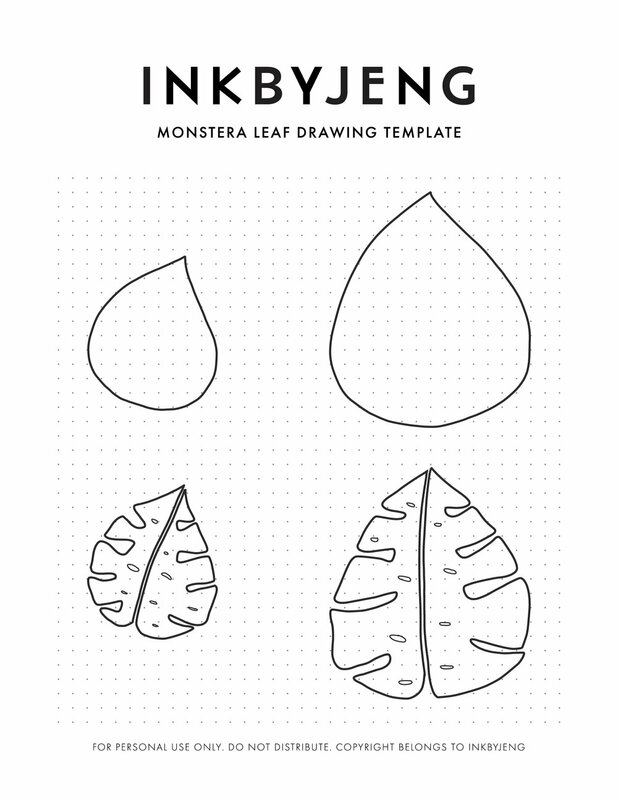 Feel free to grab this starter template for Step 1 to copy in your journal. Print it, slip it behind the pages and trace! It's sunny in San Francisco and I'm in dire need of new tank tops. I live in my workout clothes because they are comfortable and are racerback. I've been on the hunt for woven racerback tank tops, but most don't fit my short torso, so I decided to make my own! I found Pinterest to be full of ideas for making the Grainline Tiny Pocket Tank and Wiksten Tank. Larissa from mmmcrafts even provides a great post where she compares both tanks. However, these two patterns don't provide racerback options.